The Education (Secondary) Deptt., Govt. 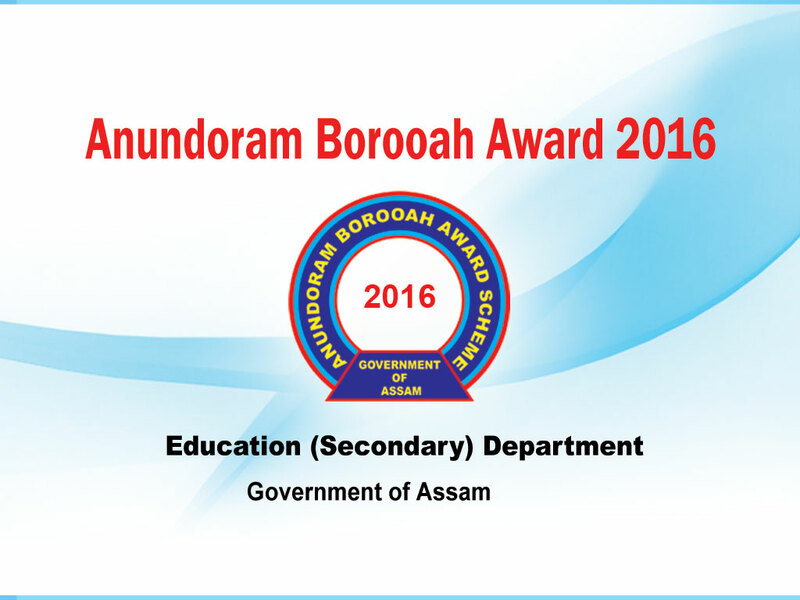 of Assam, will confer the “Anundoram Borooah Award 2017” to the meritorious students of the State shortly. Under the award package, Anundoram Borooah Award citation in the form of a Certificate along with a Laptop Computer to each student securing Star Mark and above prescribed by the State Govt. in the HSLC and High Madrassa Examination and 10th standard examination held under the Board of Secondary Education, Assam and Sanskrit Board Assam during the year 2017. The students availing the award are requested to follow the instructions available along with the application form before submitting the application online through http://arbas.assam.gov.in. Online application form will be available from 4th.August,2017 and last date & time for submission of online application is 5 P.M. of 18th. August,2017.